So we’ve had the send-offs, even if the Premier League season is not quite done – we’re not yet certain who the third team to be relegated will be and who will be the fourth team to qualify for Europe. 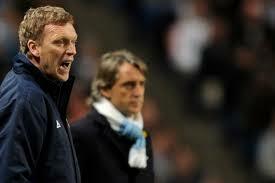 However, we’ve had the send-offs for Sir Alex Ferguson at Manchester United and his replacement David Moyes at Everton. On the other hand, a year after winning the Premier League, finishing runners up in the League and the FA Cup has cost Mancini his job at Manchester City. Expectation, when the club has wealthy and impatient owners is, as has also been seen at Chelsea, impossible to satisfy continually. Former City player, Dennis Tueart, also castigated his man management style, again talking about his tendency to hang the dirty washing out in public. We’ve talked about the ability to adapt recently, where the focus has been on individual ability to adapt. However, for Ferguson and Moyes their ability to see the importance of team cohesiveness and to develop it has been critical to their success and may be one of the key reasons why Ferguson recommended Moyes as his successor. Their ability to adapt the team, both in the context of setting up the team for a particular opponent, or during the match by altering the shape of the team, has been key to success and those notable occasions, in the case of United, that they have gone on to win with late goals. Moyes keeps lengthy dossiers on players. When buying players, Ferguson does extensive research on target players. The reason for this depth of research is simple: when bringing someone into the heart of the team, the manager needs to know who that person is, and what type of impact he might have on those around him. Their may be an existing team culture but each change to the squad impacts that to some degree, so if the cohesiveness of the team is to be maintained the manager needs to know what the impact of the change is likely to be. In the case of United, when players have threatened to disrupt that culture negatively the manager has shown them the door.